I wish the picture did it justice. Let me tell you about this recipe. It all started as a Better Homes and Gardens recipe with lots of cheese and very few veggies. I didn’t have enough cheese. I kept tossing in veggies till it looked more colorful. A star was born. Since then, I’ve made it 4 or 5 times. It is so easy, and it uses ingredients you probably already have on hand. I wouldn’t go so far as to call it a health food, but it’s certainly not a health splurge either. Please make this soup. You will be everyone’s favorite person within seconds of putting it on the table (or maybe Stephen is just biased…). I’m sorry… I have never measured. And it has never turned out exactly the same. Yet it has been delicious every time. Rest assured…. though my made-up, highly approximate measurements in this list are not entirely accurate, I’m sure they’re close enough to the truth to turn out pretty great. You can achieve Ingredient Victory. I believe in you. The chopping may take a little while, but that’s the most labor-intensive part of the recipe by far. 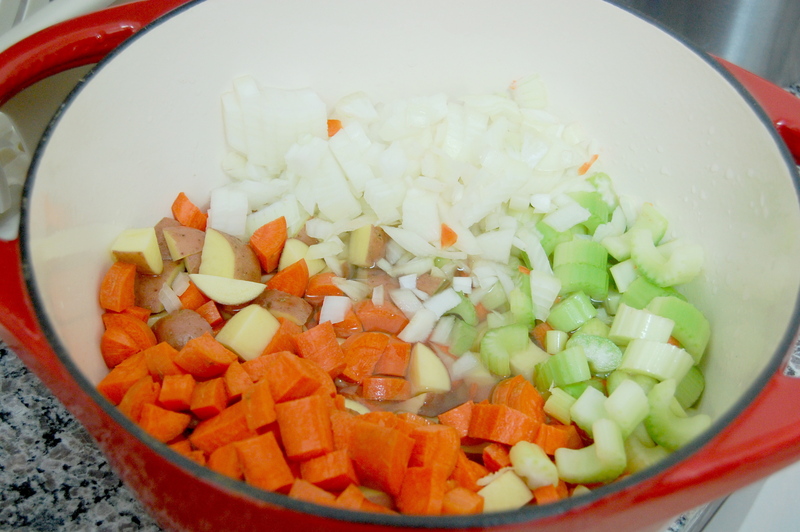 It is so quick and easy (especially compared to the burgundy beef stew recipe I posted last week…). 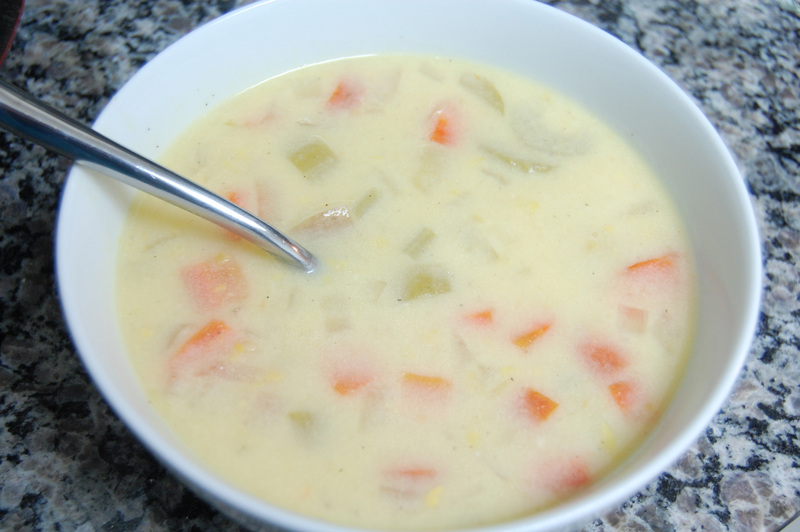 Combine water, potatoes, carrots, celery and onion in a large pot and bring to a boil. Reduce heat and simmer, covered, for 10-15 minutes (I usually simmer mine a little longer because I like the potatoes to start crumbling at the edges). Do not drain. Melt the butter in a medium saucepan (do this while the vegetables are cooking). Stir in the flour and pepper until thick and smooth. Add the milk all at once. Cook and stir over medium heat until thick and bubbly. Side note: Do not step away from the stove for too long. Milk can go from nothing to BIGMESSBOILINGOVER in approximately 1.4 seconds. Add the cheese to the milk mixture and stir until it melts. This pot should now be full of velvety, cheesy goodness. 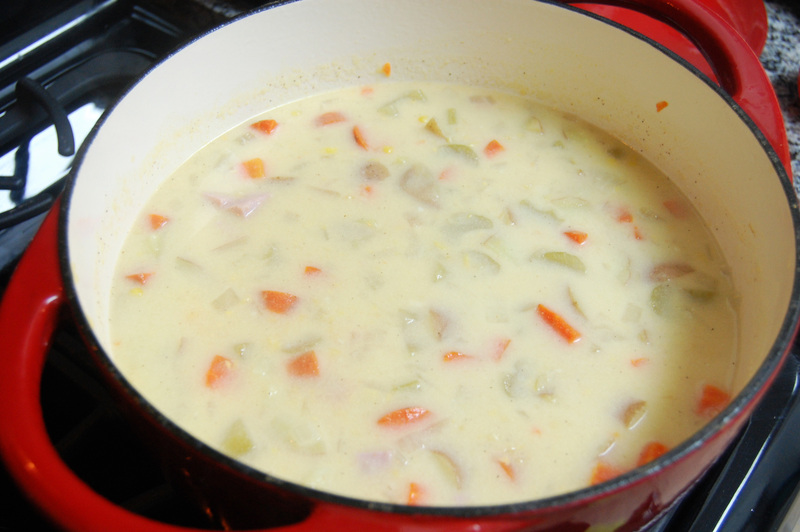 Pour the cheese mixture into the vegetable mixture whenever the vegetables are done simmering. Stir in the corn and ham. Season to taste with more pepper. Heat through, but try not to let it boil. Stephen and I usually eat this with Cholula sauce (the stuff sweet, sweet dreams are made of). It’s great with cornbread on the side! Hannah love! My roomie over here and I made this today. So very delicious, and we can find all the ingredients here! Hen hao 🙂 And I bet it will taste even better reheated tomorrow! Aww yay that makes me happy. 🙂 I was pring for you this morning pengyou!